Long before I ever heard the word egalitarianism, I saw it being lived out in the church of my childhood. For me it was completely normal and natural to see men and women serving and working together in the church. There was no subjugation of women in the Church of God—or so I thought. Normal, in my childhood, meant a woman stood in the pulpit. 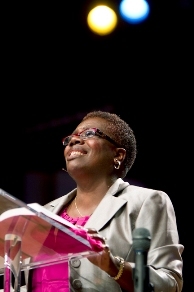 Our pastor, Lillie McCutcheon, a.k.a. “Sister Lillie,” was an iconic figure. My grandparents accepted Christ under her preaching. She presided at my parents’ wedding. She launched my grandfather as a church planter and, as a result of her preaching ministry, I heard God’s call to ministry. Normal meant hearing the Word proclaimed clearly, creatively, and compassionately from the voice of an exemplary woman pastor who had the reputation of calling the best from people, and for sending them out. The imprint of this woman pastor is seen in the lives of many Church of God leaders who grew up under her influence. 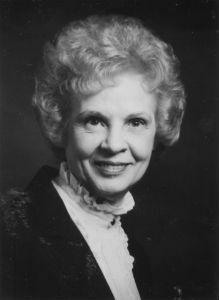 Barry Callen, Norman Patton, Jeannette Flynn, Robin Wood, Ryan Chapman, John Ackerman, Carolyn Ackerman, and dozens of other pastors, missionaries, educators, and leaders bear her ministry legacy. Normal meant that I held firmly to a belief that the Church of God was different than other groups, that we were the ones in Christendom who believed and lived out the truth that in Christ there is no gender distinction (Galatians 3:28). Only when I left home, to go to college and to interface with the church on a much broader scale, did I become aware of our sad secret in the Church of God. The secret is that we say we believe in egalitarianism, yet our practice reveals an entirely different reality. It’s no secret that in our local churches, camps and conventions, we celebrate with young women who announce their intention to enter Christian ministry. We offer them words of encouragement and affirmation. In our colleges and universities we further encourage women to receive theological and ministerial training. We continue to champion and celebrate gifted and called women in our School of Theology. Women are often the recipients of awards of distinction in our seminary. It’s no secret how we encourage women to prepare for ministry, even while they accumulate debt from student loans—often substantial debt. Then the secret is revealed. Only when our sisters, our exceptional and qualified sisters, attempt to find a position of pastoral leadership do they encounter, head on, the barrier of a reluctant church family. I heard about one pulpit committee to whom a gifted woman was recommended as their lead pastor. Some on the committee were interested in the candidate, but acquiesced when one or two others of the group suggested that it might be upsetting to some in the congregation to have a woman in the pulpit. At that point, the committee simply moved on to other possibilities. I fear that this scenario is repeated more frequently than most of us ever imagine. It must feel like a hoax to our sisters. It must seem like a bait-and-switch. It must sound like, “We want women in leadership, but we don’t want you here.” I feel ashamed of this reality. It makes me sad. We are the Church of God! We can do better! We can change the culture of our church and renew the vision of equality in ministry. We didn’t drift to where we are overnight—but if we are intentional, we can deliberately create a new egalitarian era where spiritual gifts are not diminished with regards to gender, race, or class. We can once again fly the banner of the glorious church where all people are equal in Christ and have equal responsibility to use their gifts and obey their calling to the glory of God. My dream is that it will be normal and common for young people to grow up in a church led by a gifted and exemplary women pastor. This is God’s call to the Church of God in this era of human history. Once the Church of God led the way and the culture lagged far behind. Now, the opportunities we offer women pastors have fallen behind the views of our culture towards women. Let’s reverse that trend. Let’s demonstrate our belief by our practice as we embolden gifted women pastors. This is not an unachievable dream. I’m personally encouraged that, for the first time in our history, the officers our General Assembly are gifted women. Rebecca New-Edson (chair), Cheryl Sanders (vice-chair), and Diana Swoope (chair-elect) lead with excellence. Let’s take note of this. Let’s build upon this. We can lead our congregations to do better. But how? 1. We can search the scriptures and read widely. b. 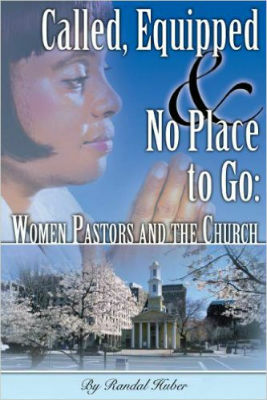 Another excellent book is Called, Equipped and No Place to Go: Women Pastors and the Church by Randal Huber. Women often face barriers of prejudice when answering a call to pastoral ministry. How can we remove those barriers? Available from Warner Press. 2. We can open doors. a. Seek out and become acquainted with women in leadership. Get to know your sister in Christ as a leader. Keep your eyes and ears open for places where you perceive she would be a good fit and suggest her name to a search committee. b. Recognize that if you are a white male, you are considered to be a person of power by many women and nearly all minority groups in our culture. Utilize the privilege given you to be one who opens doors and creates possibilities for those who might otherwise be overlooked. c. If you are male, become an advocate for your sisters in ministry. In the wider church, there are many resisters who actively seek to prohibit women from leadership roles. There are others who accept the idea of women in leadership, but do little to help their sisters. A small, select group of men have become advocates for women in ministry. I challenge you to join our ranks. Become a champion for women and others who may otherwise be overlooked. Don’t fall prey to the temptation to play it safe and hire only people who look like you. 3. We can proactively teach the church. a. Quality printed materials are available today. Take time to teach the theological truths about women in leadership to lay leaders of your church. Go Preach My Gospel is an excellent publication available to you from Church of God Ministries or from Warner Press. b. You will teach the church by how you hire and by those to whom you give the pulpit. Ask yourself how long it has been since a woman preached in the pulpit of your congregation. c. Deliberately plan to talk about women in ministry in sermons, in illustrations, and in other intentional ways in corporate worship services. More is left unsaid than said in this little article. Suffice it to say that we can and must do better in helping our movement live out our calling to give women equal standing in ministry. Let’s work together to change the future so that we no longer tolerate this sad secret of saying we support women in ministry but in reality disregard their potential. Article originally published by Indiana Ministries. Republished by permission. To read the first article in this series on women in ministry, click here. Bob Moss serves as chief advancement officer for Church of God Ministries. Learn more about the Church of God at www.JesusIsTheSubject.org. This entry was posted in All Church of God and tagged Bob Moss, doctrine, egalitarianism, Indiana Ministries, theology, women in ministry, women pastors. Bookmark the permalink.